Join or Renew Your Membership in the Victor Heritage Society. ​Click ﻿HERE﻿ to Print an August 2018 t0 August 2019 Membership Year Form. Announcements in the "BULLETIN BOARD" at the bottom of this page. Photos From the 1903-04 Labor Strike in the Cripple Creek & Victor Mining District. Homes Once Located at 410, 414 & 416 Spicer Avenue; added to Photo Gallery Featuring the Collection Titled "This Old Victor House--Then & Now". 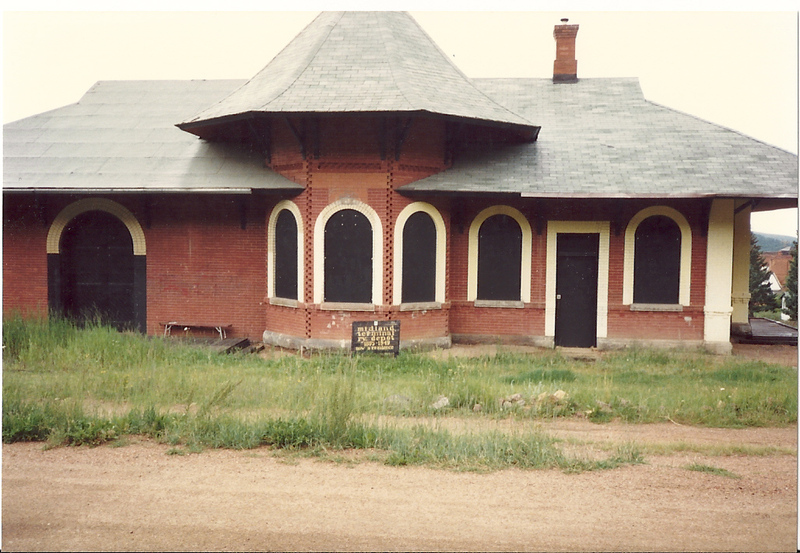 Memories of Mrs. Katy Bemore--Resident of Independence, CO When the Train Depot Was Blown Up in 1904. View the Trailer for a new Lowell Thomas Documentary--"Voice of America: Lowell Thomas and the Rise of Broadcast News". Partnership to Place Crosses on Unmarked Graves of the Unknown Buried in the Potter's Field at Sunnyside Cemetery. Click highlighted link to "Activities" Page and Scroll Down. 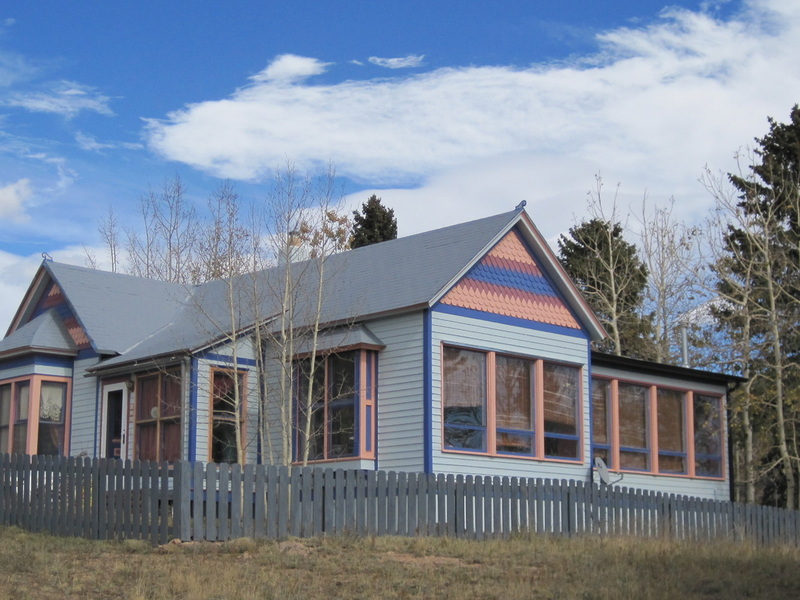 New Page -- Upcoming Events of Historical Interest in Victor, Colorado. CLICK HERE or see the Drop Down Menu on the Home Page. Step Back in Time With Glimpses of Historical Photos Featuring Victor & the Surrounding Mining District. Video of a power point presentation by La Jean Greeson, Sept 15, 2018. Working Underground in the Cripple Creek & Victor Mining District (1972 to 1979): How I Got the Shaft, the Gas, and the Broken Steel by Randall Stewart. 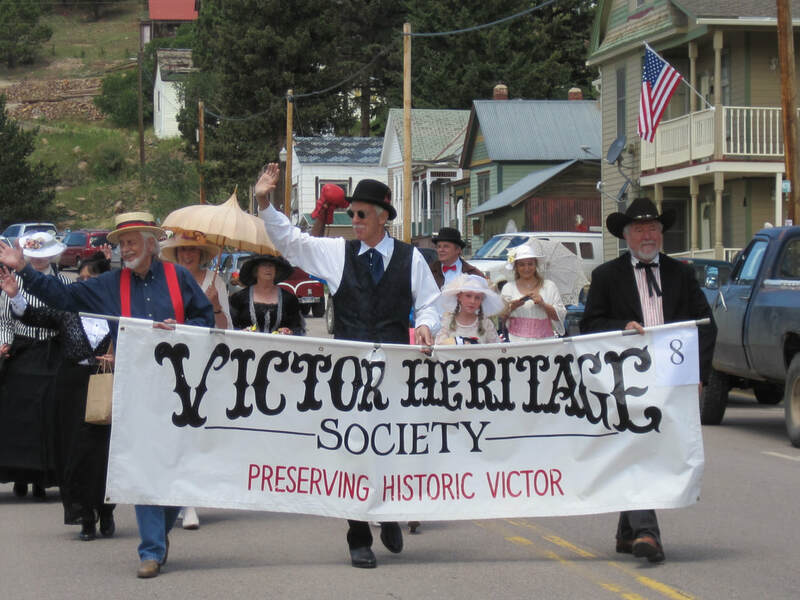 The Victor Heritage Society was formed in 1999 with the endorsement of the City Council of Victor, Colorado as a private, volunteer, nonprofit, tax exempt organization devoted to protecting and preserving the heritage of this unique community. 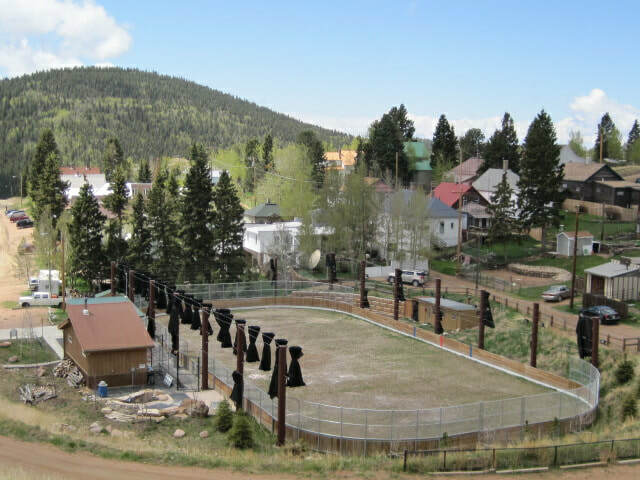 ﻿﻿﻿The mission of the Victor Heritage Society is to preserve the architectural authenticity of our historic buildings, our hardrock gold mining heritage, and the experience of living in World's Greatest Gold Camp during the 1890's and early 20th Century. 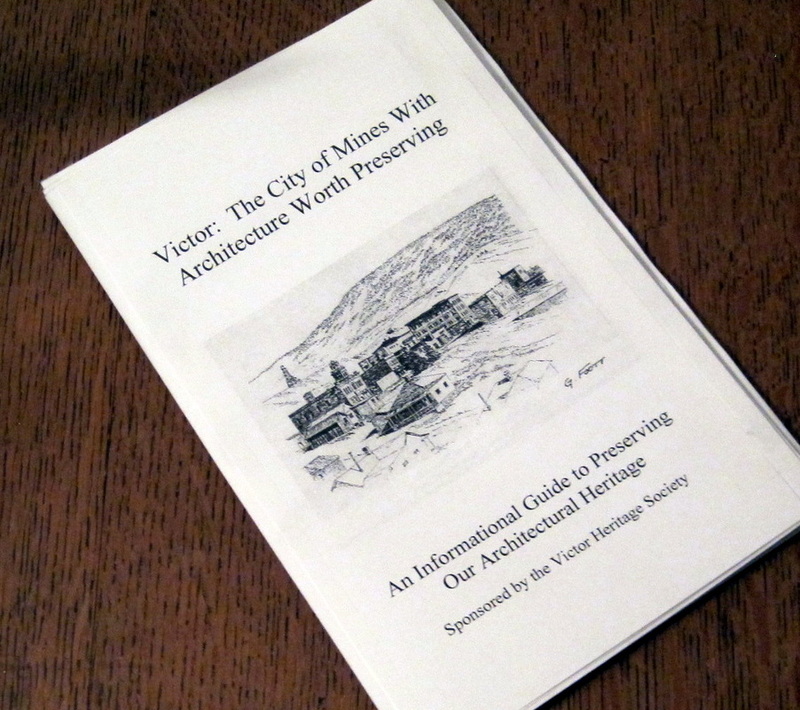 Criteria for selecting award recipients are found in a brief booklet published by the Heritage Society -- Victor Colorado: The City of Mines with Architecture Worth Preserving, An Informational Guide to Preserving Our Architectural Heritage. 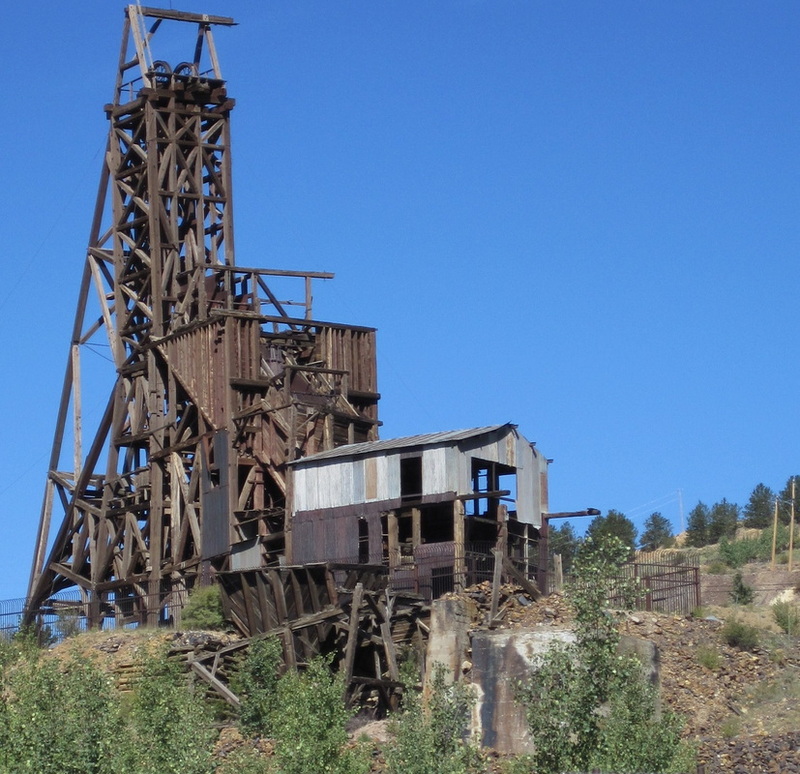 View a photo gallery of Historic Underground Gold Mines Near Victor: ​"Stratton's Independence Mine", "Gold Coin Mine--Part of Woods Empire", "Restoration of Independence Mine Headframe (2017-18)", "The Vindicator Mine". ​View a video of "Step Back in Time With Glimpses of Historical Photos Featuring Victor & the Surrounding Mining District" -- a power point presentation by La Jean Greeson. "Photos From 1903-04 Labor Strike in the Cripple Creek & Victor Mining District." "1896 Shooting Affray at the 'Union Theatre of Varieties' in Victor, CO."
"Memories of Mrs. Katy Bemore--Resident of Independence, CO when the train depot was blown up in 1904". "Working Underground in the Cripple Creek & Victor Mining District (1972 to 1979): How I Got the Shaft, the Gas, and the Broken Steel by Randall Stewart". "Installment #3. 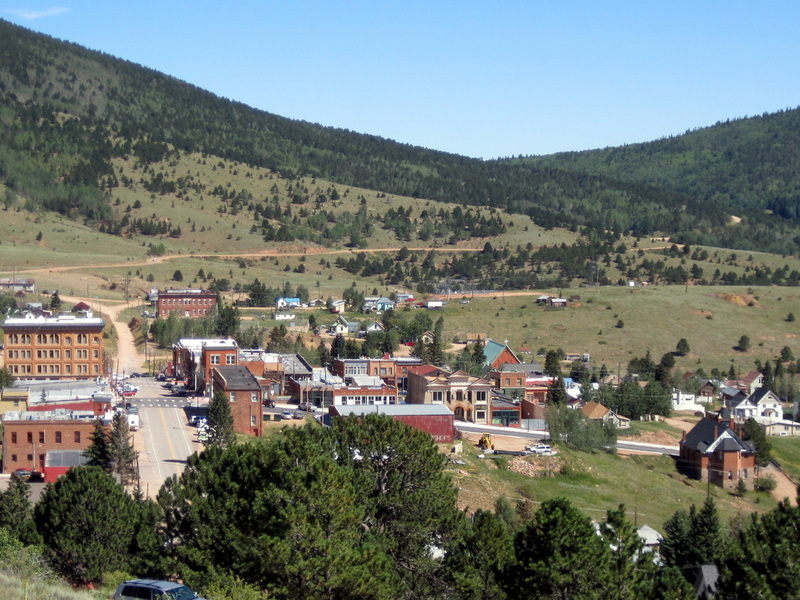 Seven Generations in Victor, Colorado & the Mining District--The Way It Was as Recalled by Eleanor Musser Baker (1920-1965) and her mother, Sadie Musser (1890-1965)". "Installment #2. 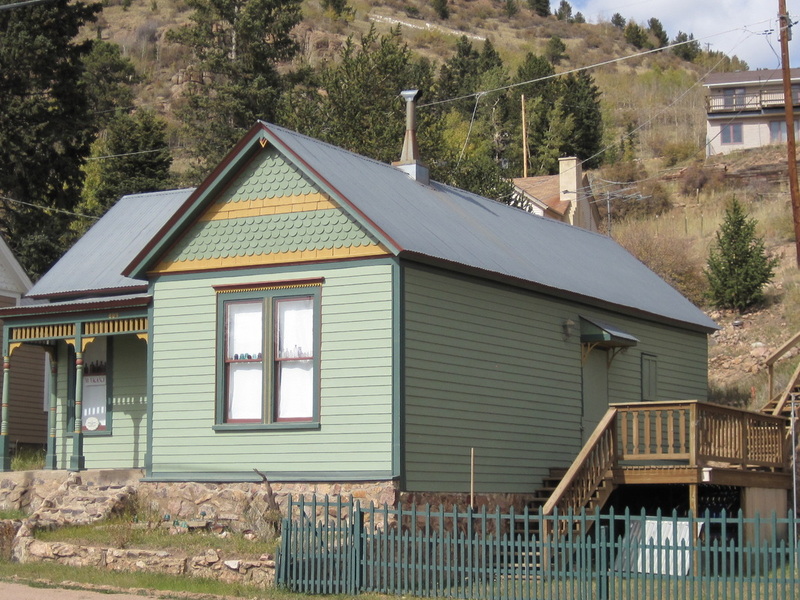 Seven Generations in Victor, Colorado & the Mining District--The Way It Was as Recalled by Eleanor Musser Baker (1920-1965) and her mother, Sadie Musser (1890-1965)". "Installment #1. 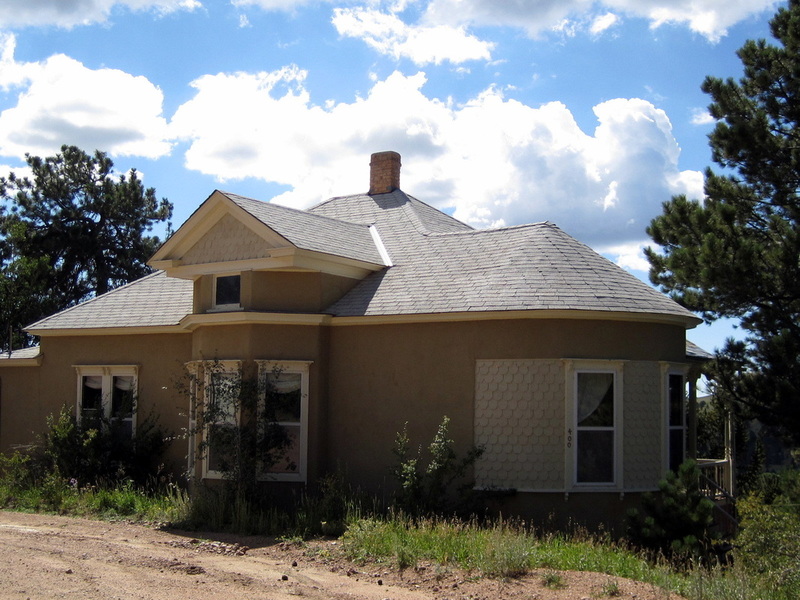 Seven Generations in Victor, Colorado & the Mining District--The Way It Was as Recalled by Eleanor Musser Baker (1920-1965) and her mother, Sadie Musser (1890-1965)". "Memories of Edward Franklin Page: Watchman at the Stratton Mines and Subsequently a Mine Manager, Farmer, Retail Businessman and Banker". "Tom Schryver's Memories of Growing Up In Victor, Colorado and His Parents--Mayme & Charles "Bumps" Chapman". 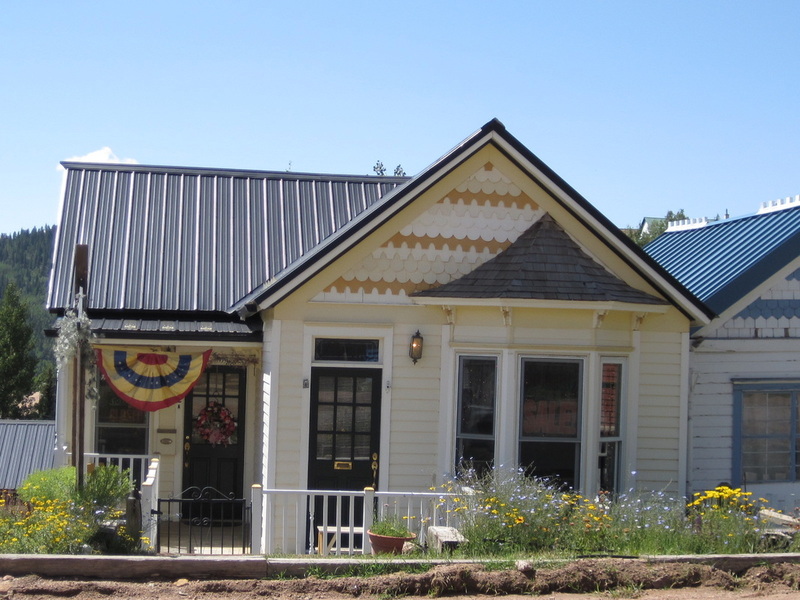 "McCORMICK FAMILY CONNECTIONS TO VICTOR, COLORADO (1893-2014): Portland Master Mechanic, Vindicator Superintendant, Scottish Poet, Labor War Casualty, Preservation Activist, Historic Memorabilia Collector". ​Mary Ann McCormick Hamm's Story of Her Brother, David "Bean" McCormick (1941-2014); Great Grandfather, William McCormick; and Great Uncle, Charles McCormick. "Paying the Piper--It wasn't fair, but Mama's smiling comment, "We Are Women," was fully understood by her young daughter only after years of living, loving, and learning." 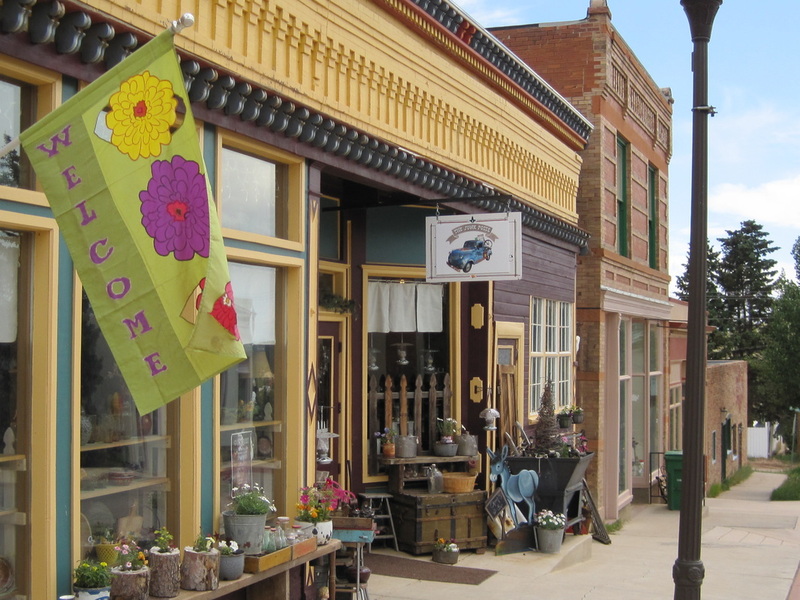 Gertrude Moore McGowan's story of Life Lessons Learned From Her Mother While Growing Up in Victor, Colorado in the Early 1900's was published in GOOD OLD DAYS MAGAZINE and submitted by her daughter, Nancy McGowan Galbraith. "Gold Camp Celebration: Fourth of July in Victor, Early 1900's--Childhood Memories Recalled by Gertrude Moore McGowan (1905-1992)" and submitted by her daughter, Nancy McGowan Galbraith. "Growing Up in Victor in the '30s" by Bob Penman. Society, PO Box 424, Victor, CO 80860 or e-mail VictorHeritageSociety@gmail.com. 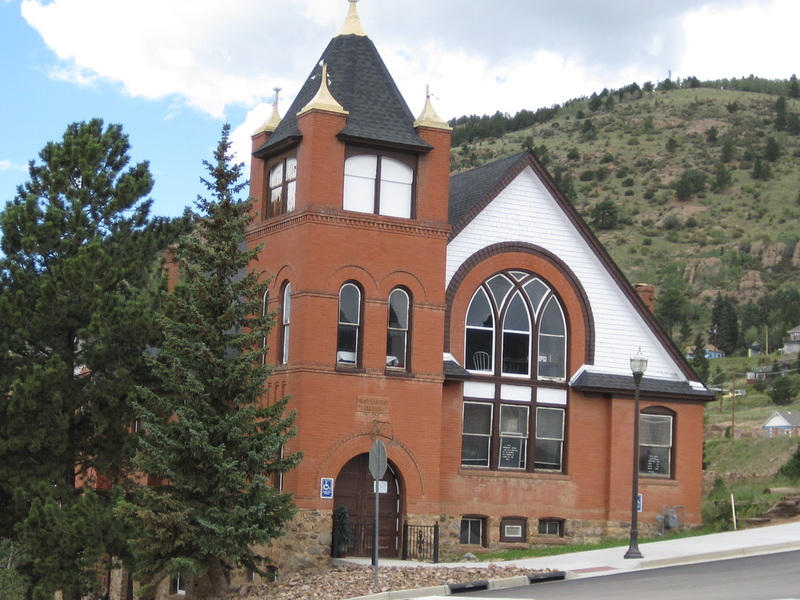 Connect with Interesting Links to other resources related to the Heritage of Victor, Colorado. Special Victor Heritage Society Membership Event at the Broadmoor Hotel in Colorado Springs--Saturday, June 2, 2018, 11:30 AM to 1:30 PM. Luncheon program sponsored by Beth & Bill Reid -- "Some History of the Cripple Creek & Victor Mining District from 1972 to 1993". Thanks to Beth & Bill Reid for sponsoring this very special event and thanks to all who attended. Victor Historic House & Building Tour--Saturday, July 21, 2108, 11 AM to 4 PM, Tickets $10 per person (photos & details at top of page). This is your chance to tour the interiors of four historic Victor homes that are generally not open to the public. Come early and stay the entire weekend to enjoy all the other Gold Rush Days Events. Thanks to all who shared their homes, served as docents, and attended the tour to make it a great success. VHS Gold Rush Days Parade Entry--Sunday, July 22, 2018, 11:45 AM. 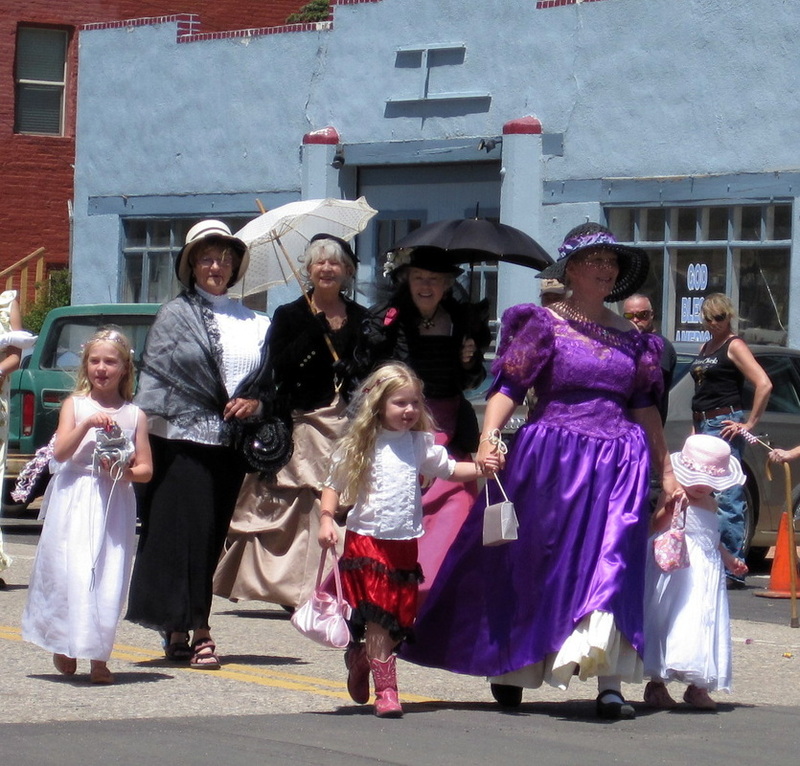 Join members and friends of the Victor Heritage Society strolling down Victor Avenue in period costume during the annual Gold Rush Days Parade. Meet before the noontime parade on the front porch at the Sandlin House (514 Victor Avenue) and follow the VHS banner along the parade route. Thanks to all who participated in the VHS Gold Rush Days Parade entry. Railroads in the World's Greatest Gold Camp: An Evening With Mel McFarland -- Saturday, August 11, 2018, 6 to 7 PM at Victor's Ag & Mining Museum (corner of Victor Ave & 2nd Street). Don't miss this opportunity to opportunity to hear Mel's presentation with a collection of slides featuring the trains that once served the Mining District. The public is welcome to this free special event sponsored by the Victor Heritage Society. Bring your family and friends. Snacks and finger goods provided. Thanks to Mel McFarland and all who helped make this event a great success by attending. Victor Heritage Society Sponsored Public Presentation of Rare Historic Photos--Saturday, Sept 15, 2018, 2-3 PM at the Heritage Center on Hwy 67 Overlooking Cripple Creek (across from the Molly Kathleen Mine). This is your chance to see an Amazing Power-Point Presentation from La Jean Greeson's Fantastic Collection of Historic Victor & Mining District Photos. Free to the public--bring your family and friends, lower level theater seats 70. Refreshments and an opportunity to visit with La Jean following her presentation. Thanks to La Jean Greeson and all who who helped make this event a huge success by attending. Victor Heritage Society "Peaches & Cream" Gathering at Victor's Ag & Mining Museum--Saturday, Sept 23, 2017, 6:30 PM. This is your chance to see the new exhibits at Victor's Agriculture and Mining Museum (corner of Victor Ave & 2nd Street). Enjoy a guided tour of the facility located in the Historic Ford Dealership building and see demonstrations of some of the remarkable vintage mining and agricultural equipment housed there. Free--no need to bring anything, peach cobbler and ice cream dessert provided. Thanks Milford Ashworth and his staff for hosting the VHS meeting for providing an interesting tour of the Victor Ag & Mining Museum. Thanks as well to all who attended. Gold Rush Days Parade--Sunday, July 16, 2017, noon. 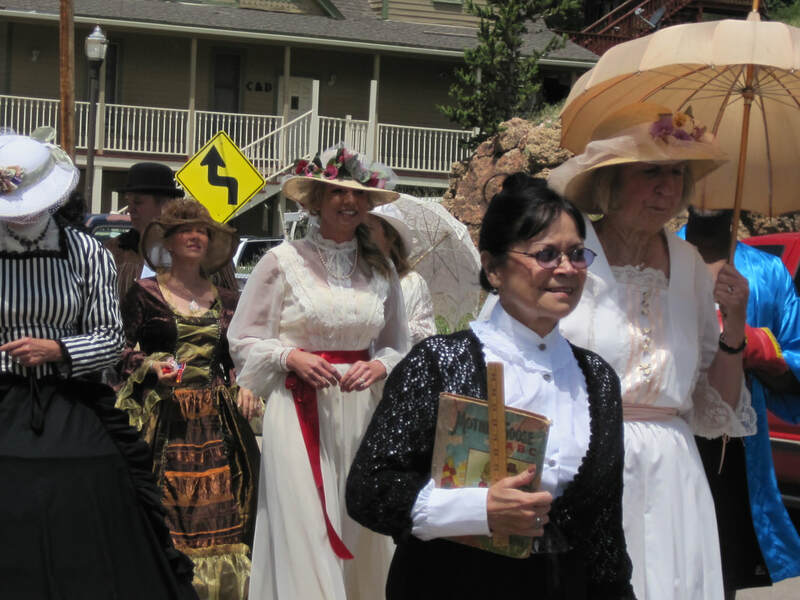 Join members and friends of the Victor Heritage Society strolling down Victor Avenue in period costume during the annual Gold Rush Days Parade. Meet before the parade at Nana's Attic and follow the VHS banner along the parade route. Thanks to all who participated. The VHS entry in the parade received a First Prize Award. Meet Jimmy Burns, Co-founder of the Portland Mine, as portrayed by Chautauqua Actor Ron West -- Saturday, July 1, 2017, 6:30 PM at Saint Victor's Catholic Church (corner of S 2nd Street & Portland Avenue). Hear the story of James Burns and James Doyle, partners and friends in 1892 when they filed a claim for Portland Mine which eventually developed into the largest mine in the District. The Portland Mining Company was incorporated in 1894 with James Burns as President and a Board of Directors that included James Doyle, Winfield Scott Stratton and several other mining magnates with divergent philosophies about treatment of employees, managing ore reserves, paying dividends, and conducting business. "Mr. Burns" will relate the story of the ensuing personality and policy conflicts, including what happened to the two Jimmy's, their oft-times embattled associates, and the fate of the Portland Mine--once deemed "Colorado's Richest Gold Mine". Free admission -- bring your family and friends. Thanks to all who attended. For more details about this even, scroll down the ACTIVITIES PAGE. VHS Meeting, Potluck, & Tour of the Historic Trade & Transfer Building Museum, 6 PM, Saturday, June 3, 2017. This is your chance to see the historic Colorado Trade & Transfer building at the corner of N 3rd St & Diamond Ave in Victor. The owners, Marjie & Joe Stevens, will provide a tour of the portion of the building which they have restored as a museum, and talk about some of the most interesting artifacts they collected and preserved in the process. A potluck dinner and brief VHS meeting will be held on site--smoked barbecue entree provided. Please bring a salad, side dish, dessert, or beverage to share. 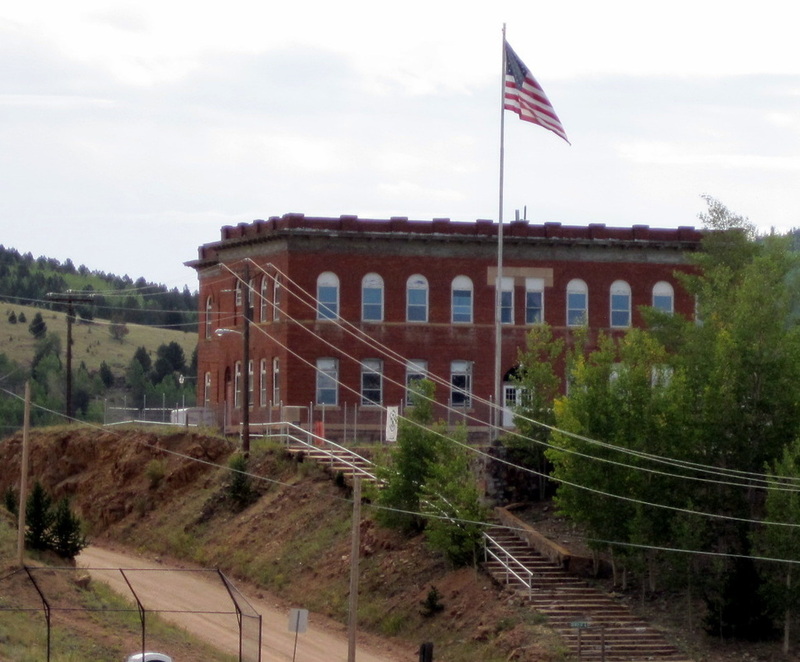 Eleven Colorado Trade & Transfer Company Warehouses once served the Cripple Creek Mining District. The Victor Trade & Transfer is one of the two that remain. 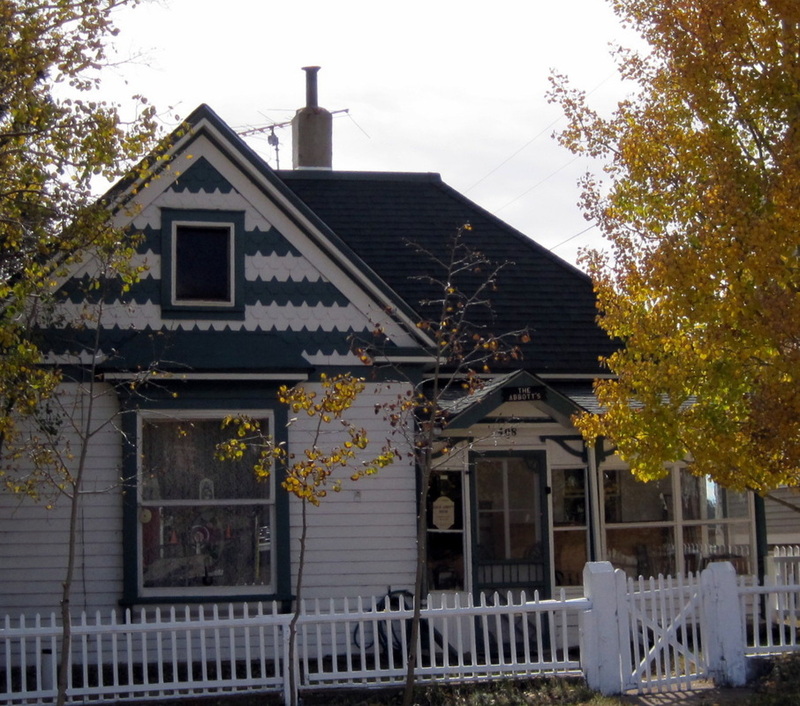 The Victor Heritage Society has recognized it with a Landmark Award. Click the blue highlighted link to the LANDMARKS PAGE and scroll toward the bottom for more information about the building. Thanks to Marjie & Joe for hosting and all who attended. ﻿VHS Board & Membership Meetings--Members and those interested in preserving and promoting Victor Heritage welcome, details announced via e-mail. If we do not have your address, contact VictorHeritageSociety@gmail.com. Victor Heritage Society invites your membership and support. We welcome the opportunity to work cooperatively with other groups, individuals, or businesses interested in achieving similar objectives. Participate as a committee chair or officer of the organization. Click Here to Print & Mail in your Victor Heritage Society Membership Form with dues for the Aug 2018-Aug 2019 year now. Victor Heritage Society is a 503 (c) (3) nonprofit organization. Your support may be tax deductible to the extent allowed by law. Keepsake Souvenir Commemorating the 125th Anniversary of the Incorporation of the City of Mines in 1894. ​ Copies available for a $10 donation at these local shops: Fragile Edge (corner of 4th & Victor Ave), Prospector's Pick (106 N 4th), Mid-Century Elegance inside Gallery 80860 (102 S 4th), Artist's Co-op in Ag & Mining Museum (corner 2nd & Victor Ave). Mail order copies available by sending your check for $15 to Victor Heritage Society, PO Box 424, Victor, CO 80860. The 2019 Victor Heritage Calendar features this cover photo and 12 other historic photos commemorating the 125th Anniversary of the Incorporation of the City of Mines in 1894. Photos contributed by Linda Irene Tingvik, Jody Cottier Wells, & La Jean Greeson. 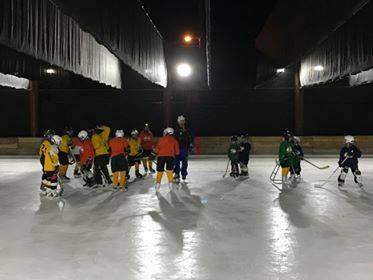 CLICK HERE for a two minute video featuring the facilities at Brian's Park Ice Rink and the Victor Penguins Hockey Club. 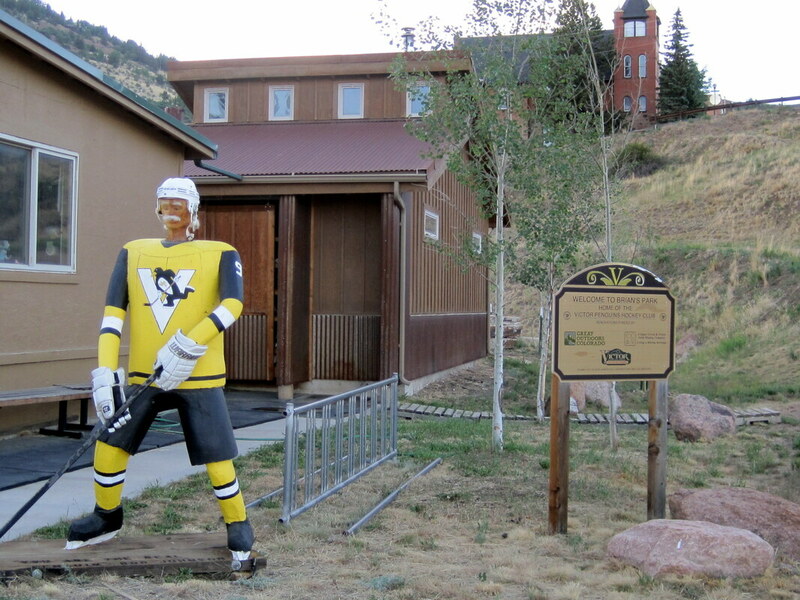 Named in honor of Brian Hayes, who has been instrumental in establishing and maintaining the park as well as forming the Victor Penguins Hockey Club, the Ice Rink is accessed from the corner of Spicer Avenue & South Fourth Street. In the summer Brian's Park Hockey Rink can serve as a soccer field. Thanks to Brian Hayes, all the volunteers, and the City of Victor for developing this facility. 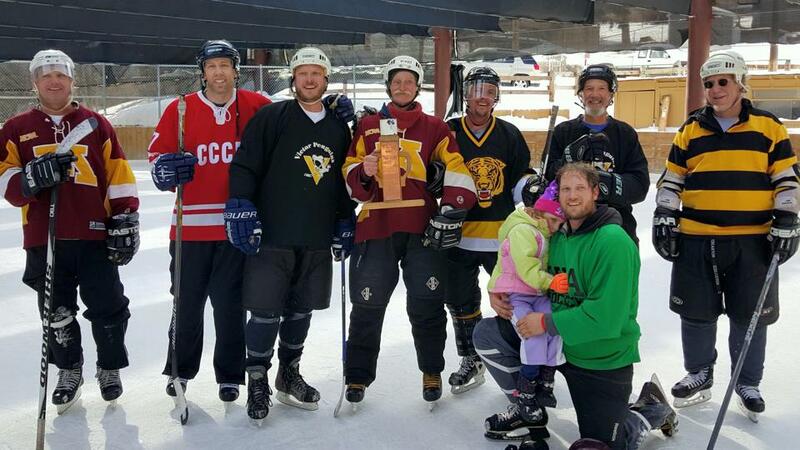 Penguin Hockey 2018. The ice rink is equipped with lights for night skating. Click photos to enlarge. Volunteers operate a Zamboni machine to maintain the ice. A changing room adjoins the rink. Brian Hayes (center) holding trophy. Victor Penguins Hockey Club Logo -- Kids and adults of all ages participate. Use of skates is available with no rental fee. 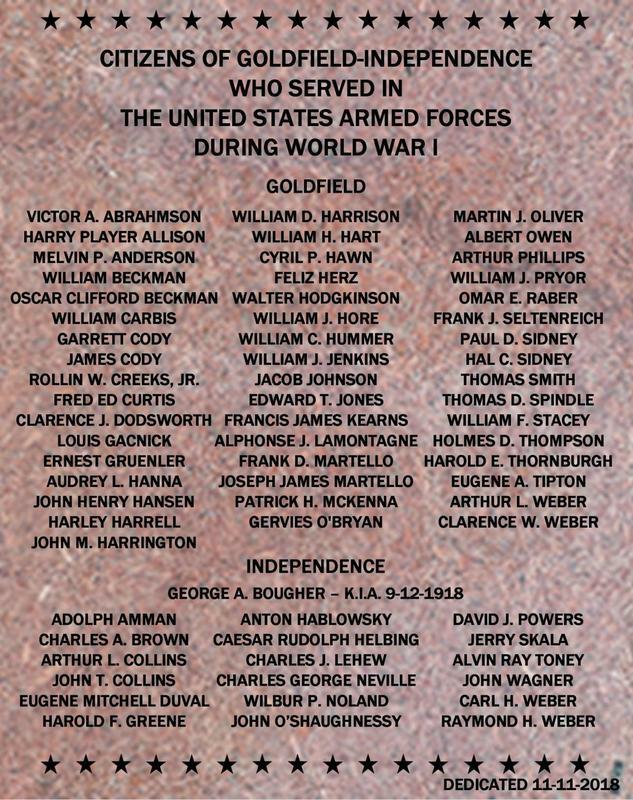 An engraved granite plaque honoring the 63 citizens of Goldfield and Independence who served in World War One was dedicated on November 11, 2018 at a ceremony held at the historic Goldfield City Hall. The plaque also commemorates the 100th Anniversary of the end of the war. 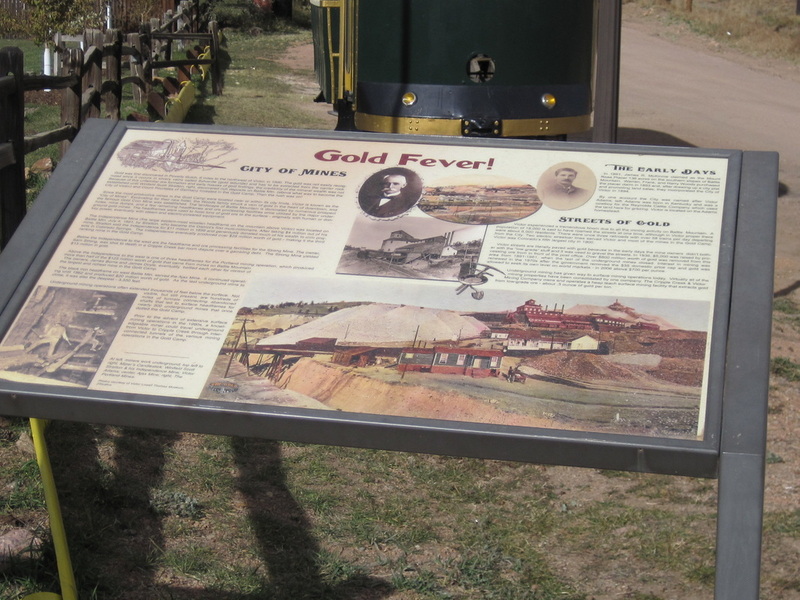 The original City of Goldfield Flag, housed at the Cripple Creek Museum, inspired the quest to erect a plaque honoring those who served. The flag has 63 blue stars on a white field surrounded by a red border. Goldfield and Independence were combined at the time and the 63 stars represent the citizens of those towns who served during the war. Researchers at the Cripple Creek District Museum, the Denver Public Library Western History and Genealogy Department, and the Colorado Freedom Memorial helped Goldfield residents Barbara Morgan, Lois and John Wilcox, and Ned Sterne compile the names of people who served during the war and who listed Goldfield or Independence as their home towns. The Victor Heritage Society served as the nonprofit pass-through for the donation to cover the cost of the plaque. 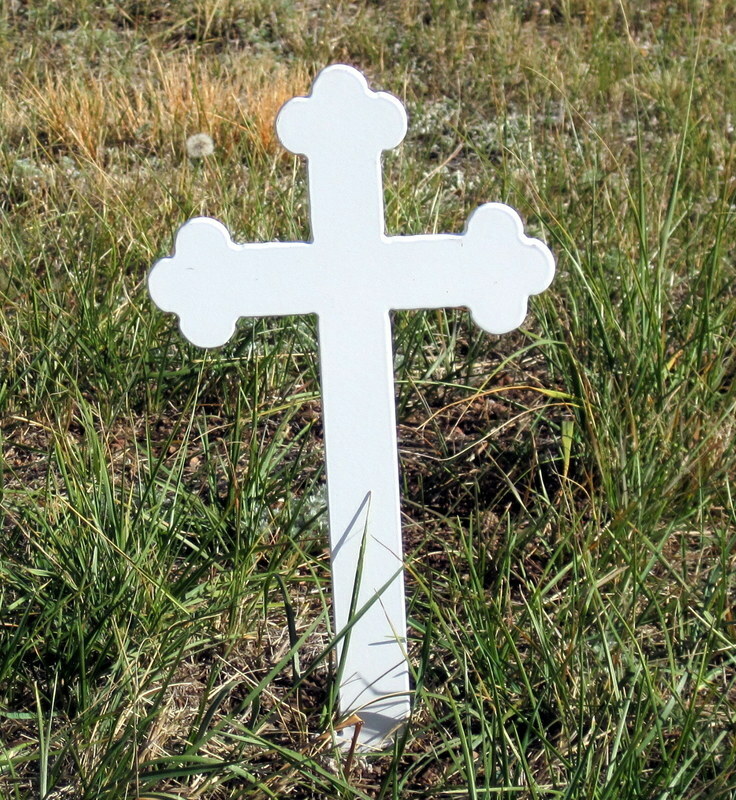 CROSSES FOR GRAVES IN POTTER'S FIELD: A project to place crosses on the 60 unmarked graves of the unknown buried in the Potter's Field at Sunnyside Cemetery was completed in October 2018. The project was spearheaded by the Marchese Family and the Victor Heritage Society partnered to share the cost. Click on the "Activities" page and scroll down for details. UTILITIES ALONG VICTOR AVENUE MOVED UNDERGROUND: A project by the City of Victor to place the electricity and phone lines along Victor Avenue underground was completed in September 2018. Also gone are the unsightly poles that once supported these utilities. 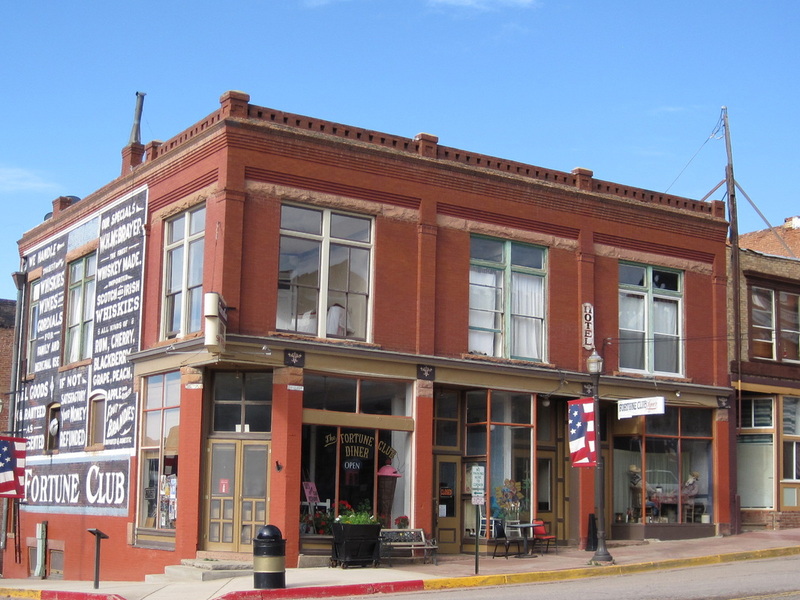 It is noteworthy that Victor and many other places in the Mining District were among the earliest locations in the United States to receive electric and phone service. Relocating these utilities underground significantly enhances the appearance of the streetscape along Victor Avenue. 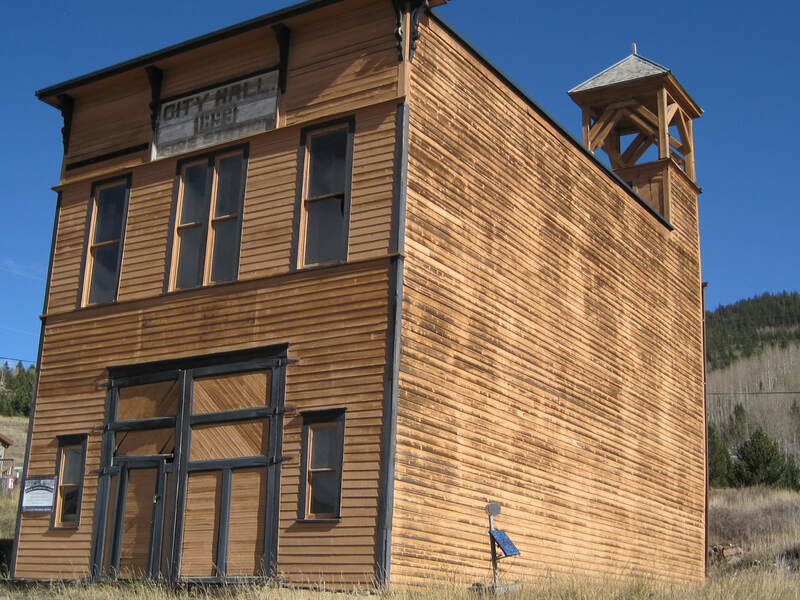 The Goldfield City Hall Restoration Committee and the Southern Teller County Focus Group are seeking donations for repairs to the building. A new deck has been installed, siding has been repaired, and the building will be painted early in the summer of 2019. The doors will also be repaired. Total cost of the project is about $10,000. The Goldfield Restoration Committee is providing $4000. Victor Heritage Society has pledged $1000. The STCFG has spent about $500 so far and will also donate additional funds. 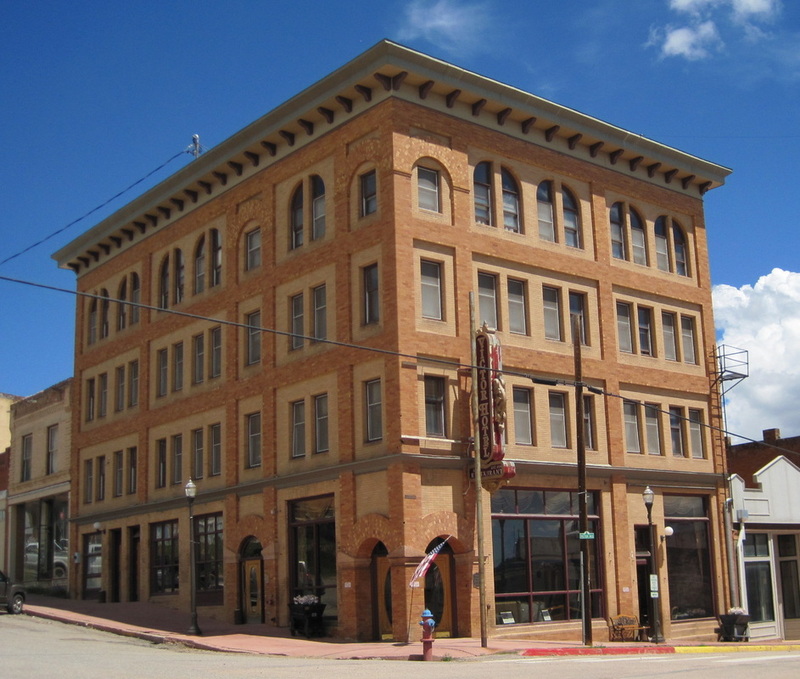 The historic building is owned by Teller County government but it does not have any funds budgeted or intentions to repair the building. Donations can be dropped off at the Victor Lowell Thomas Museum (open weekends) or mailed to STCFG, PO Box 328, Victor, CO 80860. Gold Rush Days 2017. We had a great time. Hope you did too. Victor Avenue dressed in period costume during the annual Gold Rush Days parade. helping celebrate Victor's proud heritage! Our entry received a 1st Prize Award! 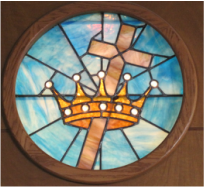 This stain glass window from the Iconic Victor Christian Christian Science Church Building, "Gone Forever--But Not Forgotten", was recently discovered. For details, scroll to the bottom of the "Preservation Successes and Challenges" Page. Please contact us if you can share more information about its journey.